The romantically derelict Kreuzberg stole Stiina’s heart. 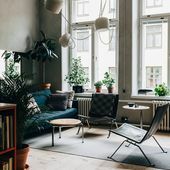 The atmospheric home in Berlin is decorated with Finnish and Scandinavian design as well as flea market finds. Stiina Huhtanen, spouse Alex, and their son Jooa. 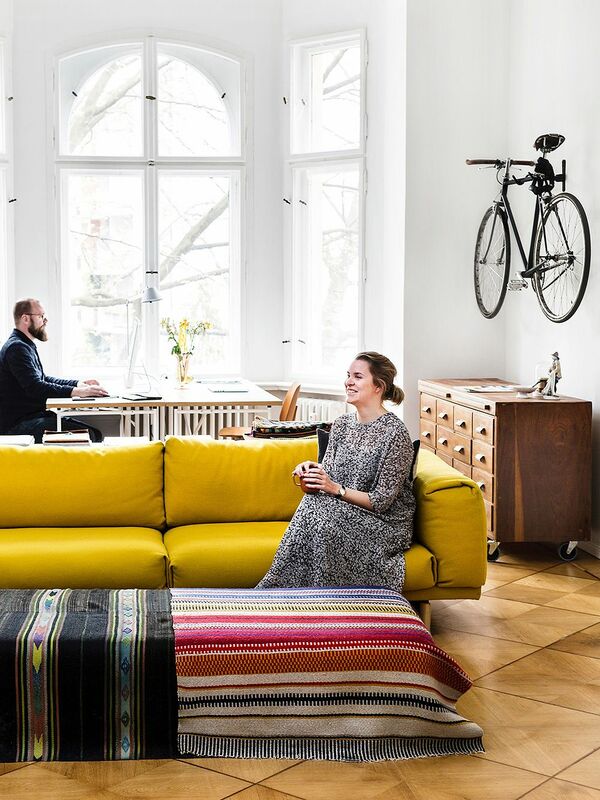 The home is a 120-square-meter apartment with three rooms and a kitchen in an over 100-year-old Berlin building. 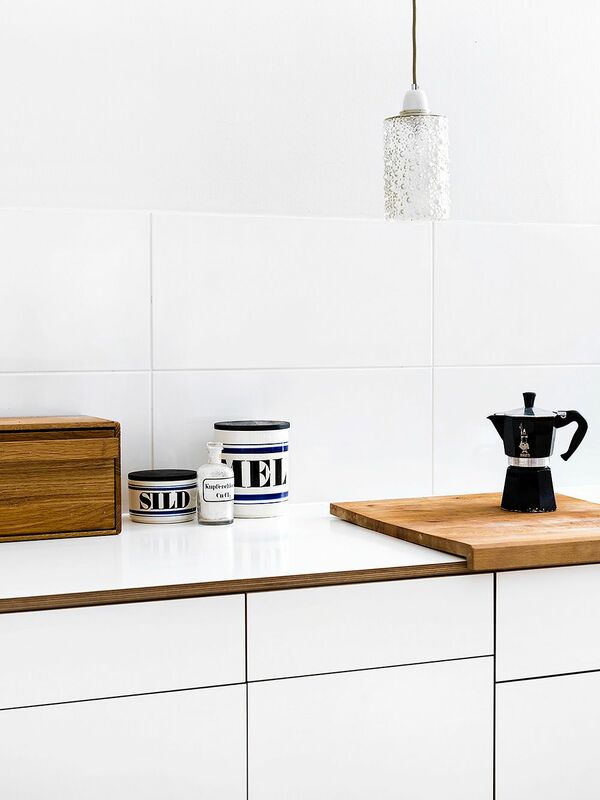 In Central Europe kitchen furnishing move with the apartment’s inhabitants. Stiina and Alex managed to buy this architect designed kitchen from the previous owners. TWO YEARS AGO, Stiina Huhtanen and her husband Alex moved out of the Kreuzberg area of Berlin. However, they returned six months later as no other part of town felt like home. 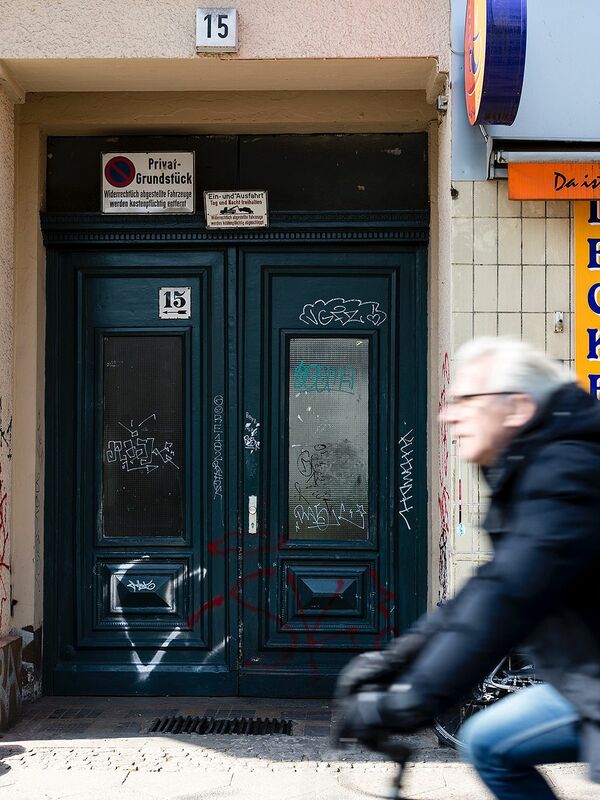 Kreuzberg has fallen into some disrepair from its Prussian glory days but the beautiful architecture still stands out. Today, the buildings’ facades are tagged with graffiti. ’The grit does not bother us – inner beauty is more important”, says Stiina. She is from Oulu and Alex considers himself from Cologne. They met each other through a common German exchange student friend and moved in together ten years ago. The family also includes three-year-old Jooa. Alex and Stiina painted the wall with Farrow & Ball’s Smoking Green color. The hue is a compromise as Stiina wanted green and Alex blue. Alex collects frames and the pictures change frequently. The family’s first floor home has preserved the building’s original, sophisticated features. While the location of the kitchen has changed over the years the ceiling’s moldings and rosettes are still there. The four-meter ceiling height has been utilized in a personal manner. One wall has a collage of paintings, another has a long shelf while a bicycle hangs on a third. The hallway functions as a conduit between the bedroom, kid’s room, the combined living room and office space as well as the kitchen. A clothing rack has been built into an unused doorway. The bathroom and a storage closet are found at the back of the kitchen. Coffee is made using a Bialetti. The kitchen used to be a so-called Berlin Room, the space between the building’s wings. Alex and Stiina compromised and painted the kitchen wall smoke green and hung lots of paintings. Alex collects frames and the pictures change over frequently. They often display vintage magazine covers and pictures from their travels. The space does not feel tight due to the generous ceiling height. The kitchen is full of small, and large, details the biggest being the dining table that Alex had commissioned. With a little wink he shows us dishes bought by Stiina’s mother. The kitchen’s Thonet chairs are from an old theatre. Two LCM chairs, designed by Charles and Ray Eames, can also be found at the table. There is another Eames chair in the bedroom. Much of the rest of the furniture has been found from flea markets or a nearby used furniture market. The couple’s work space is in a bright bay window. 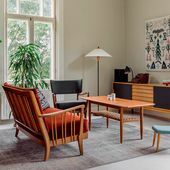 The architect’s tables were designed by the German Egon Eiermann in 1953. The wooden chair is a Thonet, according to Alex, though it has had its legs changed to be stackable. The large 1920’s lamp is from a flea market. You can walk straight from the kitchen to the living room and office area. The couple works from home: Stiina is primarily a stylist and works for an international clothing company and Alex has a design consultancy. The space is dominated by a bookshelf that runs the length of the wall. The shelf holds a collection of items from various trips. Generally, an addition to the family complicates travel but Stiina says that they have had the opposite experience. Stiina and Alex share their home with their work. The over century old wooden floor is in great shape. Some of the shelf’s books are finds. In Berlin people often leave things on the street, particularly books. The tram car is a souvenir from Lisbon. Muuto’s yellow Rest sofa acts as a divider in the living room. Behind it, in the large bay window, is the joint work space. 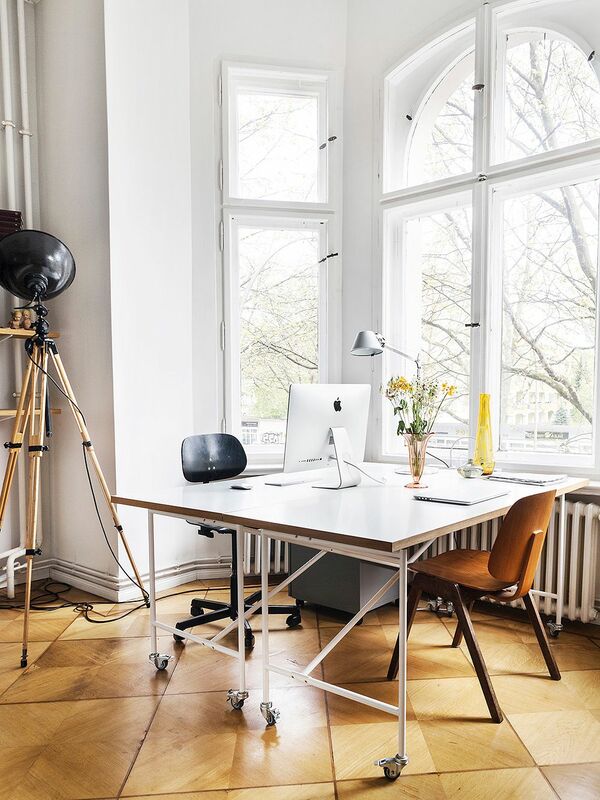 Alex is very proud of the space’s design and tells us how the table designed by Egon Eiermann and Artemide’s Tolomeo table lamp are classics favored by architects. The Rest sofa from Muuto divides the living room from the work space. 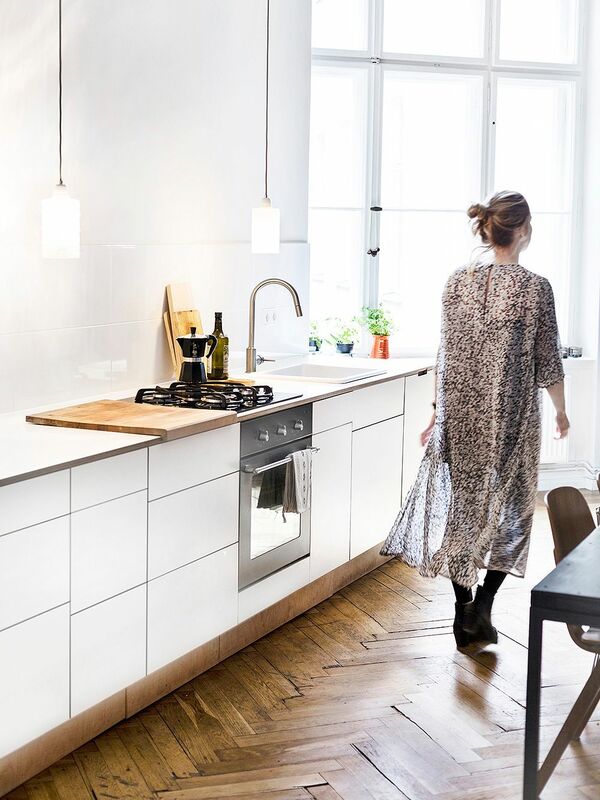 Scandinavian design is popular in Berlin. The entrance into the kid’s room is through handsome double doors. The rooms were ideally designed for their original purpose as the doors allowed the music room and library to be used as one large space where 19th century aristocrats could enjoy high culture. The child’s room is used for guests when the house is full of friends. 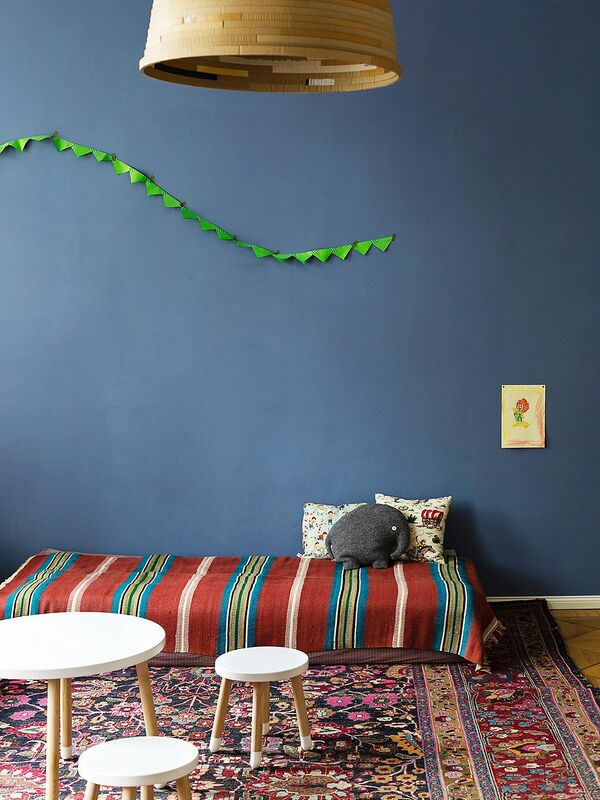 The rug was bought from a Berlin flea market, the guest bed cover is from Finland. 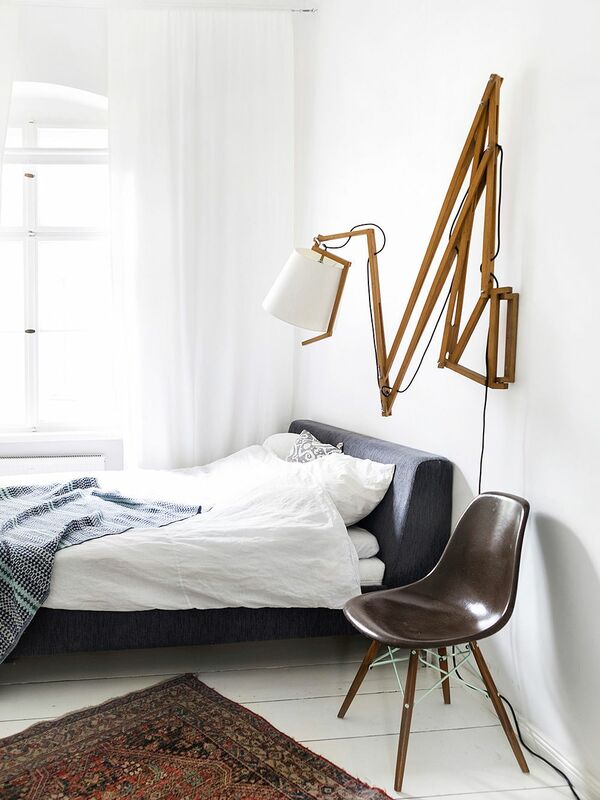 Alex bought the bedroom wall lamp from designer Michael Wolke when he was still a student. 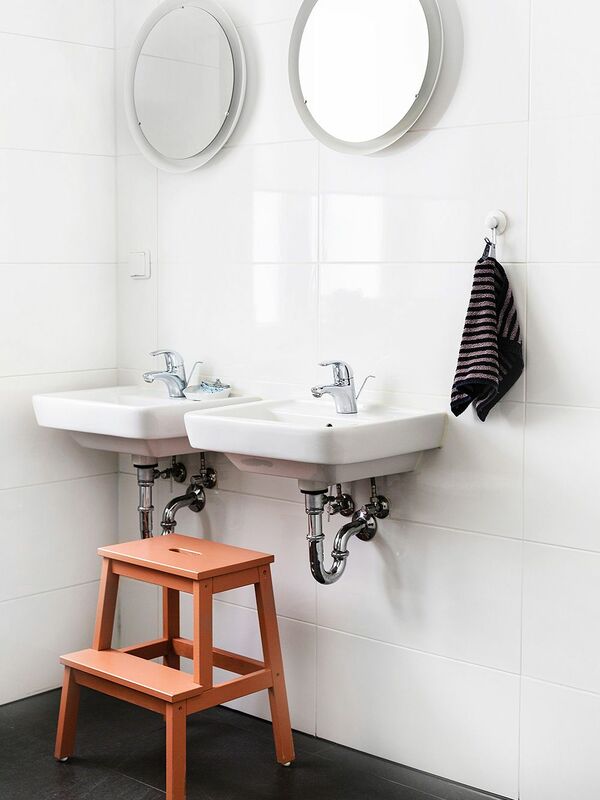 The Eames DSW chair was ordered from the United States. The blanket is from Lapuan Kankurit. Exceptionally, the bathroom has two sinks. Marimekko’s hand towel adds a touch of Finland. Opposite the kid’s room, on the other side of the hallway is Stiina and Alex’s bedroom. Light fixtures from HerrWolke connect the bedrooms. Alex bought the lights from designer Michael Wolke when he was still a student and as such they are the sample models made out of recycled cardboard. The large and well-known parts of Berlin were built between 1850–1914 when industrialization increased the city’s population and its need for housing. This period of rapid building is often referred to as the Gründerzeit. Even though Kreuzberg was primarily built for the working class the main streets also attracted richer Berliners. One of Kreuzberg’s main streets, Stresemannstraße, leads directly to the Potsdamer Platz square. The owner of the building would often live on the first floor in the so-called Die Beletage apartment (the beautiful floor in English, from the French concept of bel étage). Typically, the first-floor apartments were better equipped than those on the higher floors. For example, the ceiling was often decorated and the floors were patterned hardwood. These homes had rooms designed for listening and playing music as well as for reading. Such rooms were even more lavishly decorated since they were used for entertaining guests. A specialty of Berlin is the Berlin room or Berliner Zimmer, which is denoted with a BZ on the floor plan. This dark corner room is the result of the building code of the time that required large inner courtyards. The room is between the two wings of the building and is one of the most used rooms despite not the most inviting due to its limited light. This article was originally published in Avotakka.